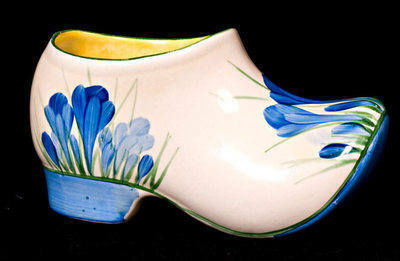 Clog (Sabot) in the Blue Crocus pattern. Quite rare to find one in Blue and with the Bizarre backstamp. Size is 5.5 inches long. Signed Bizarre by Clarice Cliff and also has the pattern number 6393 written in blue underneath. Dates to 1935. Excellent condition. No damage or restoration. Price £395.